*My apologies for publishing this review slightly late and past the weekend. I needed to take a few days away to affirm my thoughts about this film since I felt it was really good after viewing it. It is to confirm I'm not allowing emotions left over from a slightly disappointing Spider-Man 3 to prejudice my analysis. But then Spider-Man 3 and 28 Weeks Later are different films of differing genre altogether. Hope you'll enjoy this review. Bloody good. 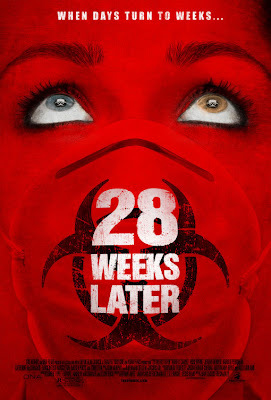 28 Weeks Later that is. The film is so much more than what can be interpreted from the trailer. This sequel to the 2003 surprise hit British film proves to be an even bigger surprise, right from the first minute. In a candle-lit kitchen, a woman prepares tomato sauce pasta. Her husband takes a bottle of red from the shelves. Their faces revealed worry and distraught. The camera now moves to the dining table. An old couple sits there. And there was also a younger woman. She’s handed a plate of pasta. She places it on the table space beside her. He advises her that her boyfriend has been missing for days and will not be back. He tells her off saying that if her boyfriend ever returns, it would be her blood he’s interested in and not the pasta. (Tomato sauce pasta, a bottle of wine, and blood, can you see the relation? The soft silence suddenly breaks. There’s knocking at the door. A boy is shouting for help. He wants to come into the house. To open the door or not? The man decided to open the door. From a town nearby he says and he’s being chased. The anxious younger woman looks out of the house through a gap. It’s a game of tag. One by one they’re tagged. The last of them is the woman, Alice (Catherine McCormack), and the man, Don (Robert Carlyle). They’re cornered in a room at the top floor of the house. He can’t save her, he’s terrified, and through a window he breaks out of the house and runs. Music plays, the familiar tune from 28 Days Later, the tune of hopelessness and despair. He looks back and she’s watching from behind a window. He looks around; he’s being chased by dozens of bloodthirsty zombies. He keeps running toward a river. What a start to this movie I thought. A thrilling entrance accomplished by a change of pace. Suddenly I’m wide-awake in anticipation. This is the sequel to 28 Days Later. The last of the zombies have died from starvation in 28 Weeks Later. Aerial shots of London showed a deserted city. The country is now being reconstructed and an enclosed area under the protection of the military, known as District-1 is ready for re-inhabitation. In comes the new residents and among them is a pair of siblings, Tammy (Imogen Poots) and Andy (Mackintosh Muggleton). They are the children of Don, the man who escaped earlier in the film. He’s now one of the in-charge of District-1 with a triple A, Access-All-Area pass. Snipers guard District-1 from rooftops, they complain of nothing to shoot at and spend their nights surveying the privacy of the residents through their riflescope. One of them is Doyle (Jeremy Renner). Don recaps the story of his escape to Tammy and Andy. He tells them they are not ever going back to their house. He tells them their mum died there, the day of his escape. For the benefit of those who did not watch 28 Days Later, these zombies are actually humans infected by the Rage virus. The deadly virus transforms the infected in a matter of seconds to blood thirsty and flesh hungry zombies. The Rage virus wiped out the population of Britain. District-1 is the first of a program to re-populate the country and it is under the supervision of the military, headed by General Stone (Idris Elba). Aiding the program is Doctor Scarlet (Rose Byrne), who makes sure of the quarantine at District-1. All is well until one day when the children, Tammy and Andy, who misses their mother, sneaked out of District-1 to return to their house for a photo of mum. There they discovered an infected but not zombified mum, Alice. As the military caught up with them, they too brought Alice back to District-1 where she’s quarantined. Alice could be a valuable asset, she seems to be immune to the Rage virus. As Stone and Scarlet discusses the fate of Alice, Don by himself went to see her. It’s another change of pace. This time it’s Code Red. The lead ends here, for the action begins. 28 Weeks Later is better than 28 Days Later in many aspects. It’s also a sci-fi, horror, thriller that is outstandingly produced. What is apparent in the film is its military element. It is a dimension that gave the story its shine. The use of military vs zombies rather than the usual guns against zombies is a smart way to liven up a genre of this sort. Much credit has to be given out. The entire crew and creative team have done an excellent job with this film. This is not a brainless free-for-all flick that makes entertainment out of blood spilling angry zombies attacking bewildered screaming humans. There are lots of details painstakingly thought up and molded together for this film. The audience are well lead by the camera, which catches plenty of details and mood. From the plot, sub-plots, scenes, dialogues and cinematography, everything is top notch. It is a pleasure to watch even though I really should not encourage violent and killings. But a movie of violent and killing it really is not, at least not excessively, scenes of such is used only when emphasis is stressed. It is more so the underlying meaning of the story and the thoughtfulness of movie-making that are compelling. Seldom is there a genre of this kind made this way. In a story point of view, we could substitute the effects of the Rage virus to that of an outbreak of new disease or epidemic, and even in more recent terms, terrorism. The consequences of such can be seen in 28 Weeks Later. The deployment of military force is almost a certainty for situations like these. The measures used are not exaggerated for they can be very real. Therefore I strongly urge parental guidance. The film is enjoyable but not to be taken for granted as just entertainment. There are no big stars here but it is for the better so as not to take the shine off its presence. You’ll get the scares here and there and will definitely feel the pace when the characters start running. What is most notably well done is how director, Juan Carlos Fresnadillo uses silence and pauses along with darkness and camera shakes to depict some scenes. For non-fans of the horror thriller type film, it may be hard to watch as with all horror thriller but do give 28 Weeks Later a shot. It really is bloody good and I meant that in an expressive way, just as the film is. This film itself is the real rage, not the virus.